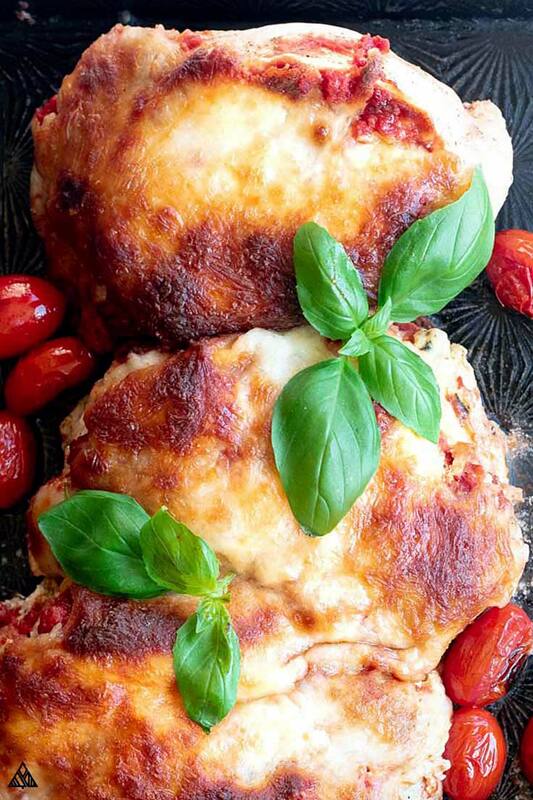 Lasagna Stuffed Chicken — Super Cheesy and Delicious! 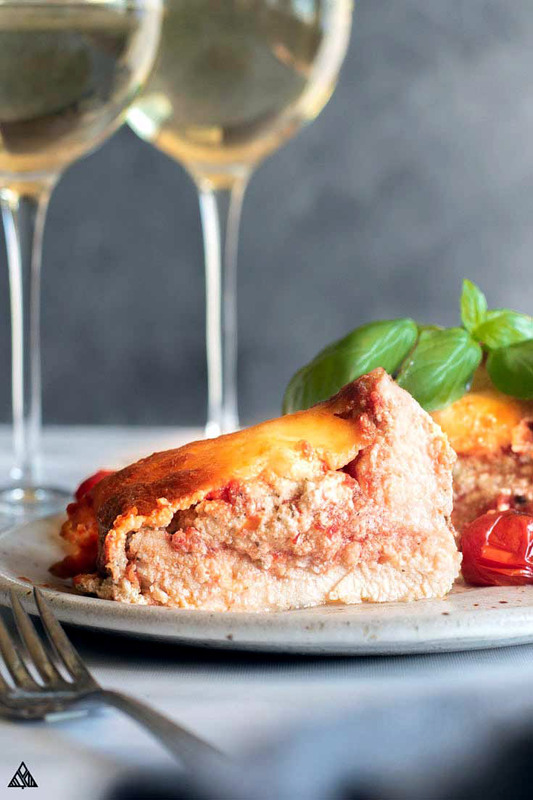 Picture the most craveable collection of ingredients stuffed inside a chicken breast, and I can almost guarantee you’ve imagined this lasagna stuffed chicken breast recipe. The cheesiesy, oeeyiest, sauciest and most delicious way you’ve ever enjoyed a piece of chicken! Because let’s be honest. Chicken is boring. But lasagna stuffed chicken? Is definitely not. 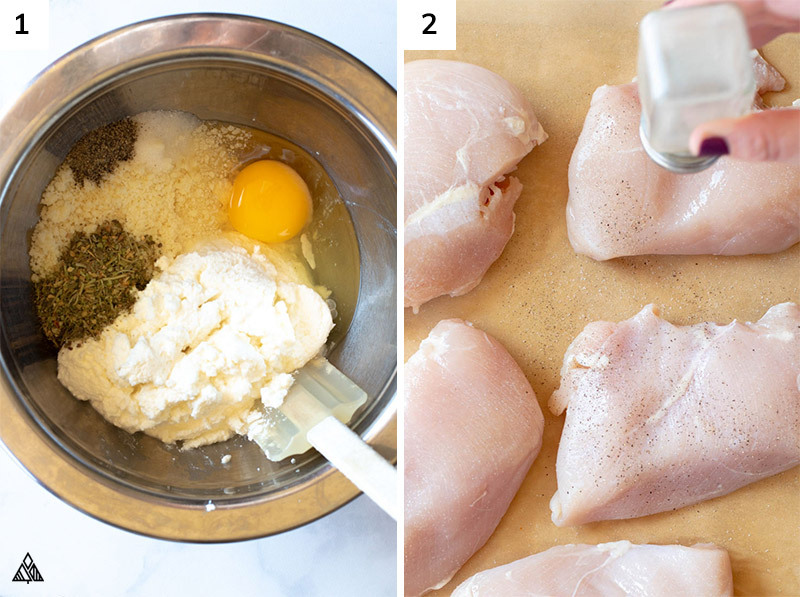 And it’s about to become your new family favorite chicken recipe. 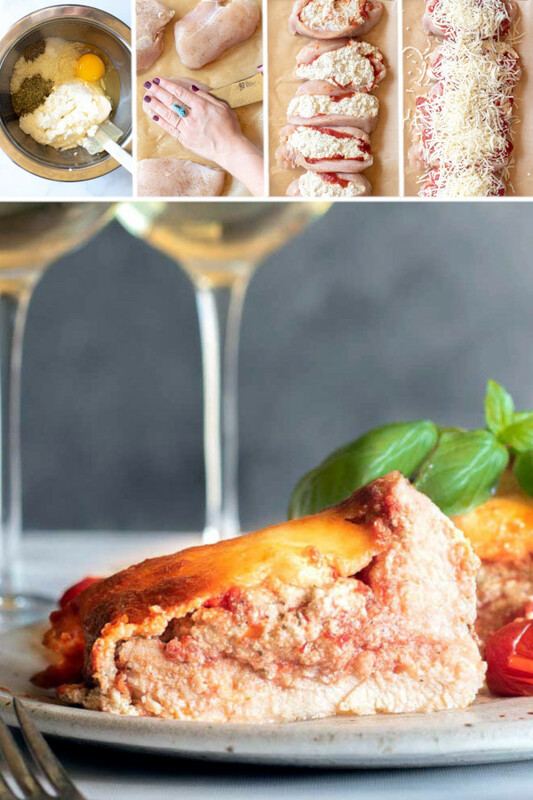 So turn on that oven, bump the Sinatra, pour yourself some pinot and let’s make this lasagna stuffed chicken recipe! Do not cut the chicken all the way in half, we want to form a “pocket” for the stuffing to fit inside of. Forming a sandwich with two chicken halves will create a giant mess! 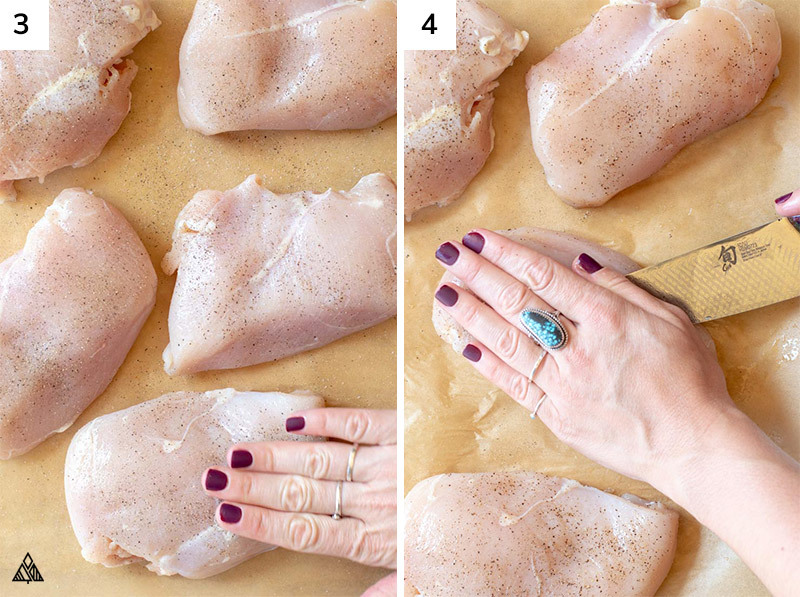 I do this with a sharp knife: carefully place your hand over the chicken breast and slice through the center — ensuring you don’t reach the other side with your knife! We’re essentially butterflying the chicken breast. Start by cutting into the thicker side of the chicken and making your way to the thinner part. Butterflying is certainly easier than creating a pocket in your chicken breast, up to you and how you’d prefer to eat your lasagna stuffed chicken! The second tricky part is making sure the lasagna stuffed chicken is cooked through without losing your delicious juices! The simple solution to this is to use a meat thermometer — stick the thermometer into the thickest part of your thickest lasagna stuffed chicken breasts, and ensure it’s reached a temperature of at least 165 degrees. 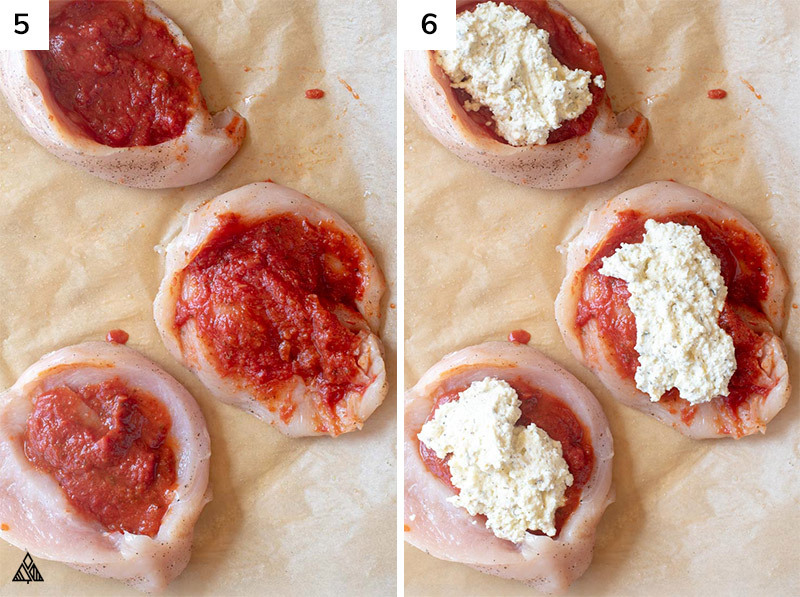 There’s one ingredient swap I make to keep this Italian stuffed chicken breast in the low carb recipes zone — I use low carb pizza sauce instead of marinara. 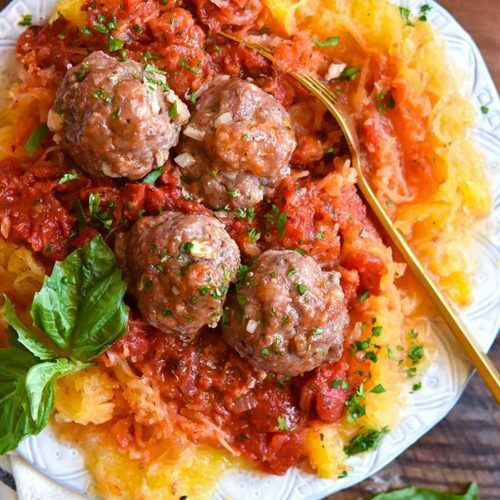 Marinara is delicious, but adds 40 grams of carbs to this recipe (this varies depending on the exact product you buy)! By using my low carb pizza sauce, we shave off some carbs (due to the lack of sugar added to my recipe) — use whatever you prefer or is most convenient. You can mess around with different spice combos, toppings and cheese varieties if you’d like. Just keep the measurements the same as listed in the low carb lasagna stuffed chicken recipe below. 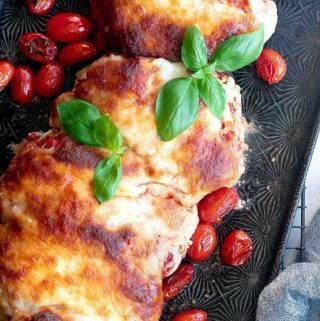 All the other lasagna stuffed chicken keto ingredients are necessarily to make the flavors of this dish come together! All low carb meals taste better with toppings! Here are some of my favorite toppings for this baked stuffed chicken breast, if I missed your favorite leave me a comment below! And those of you who aren’t eating low carb could serve this with pasta, rice or anything you fancy. You’ll want to use skinless, boneless chicken thighs for this. You’ll know the thighs have cooked through when a meat thermometer reads 165 degrees. 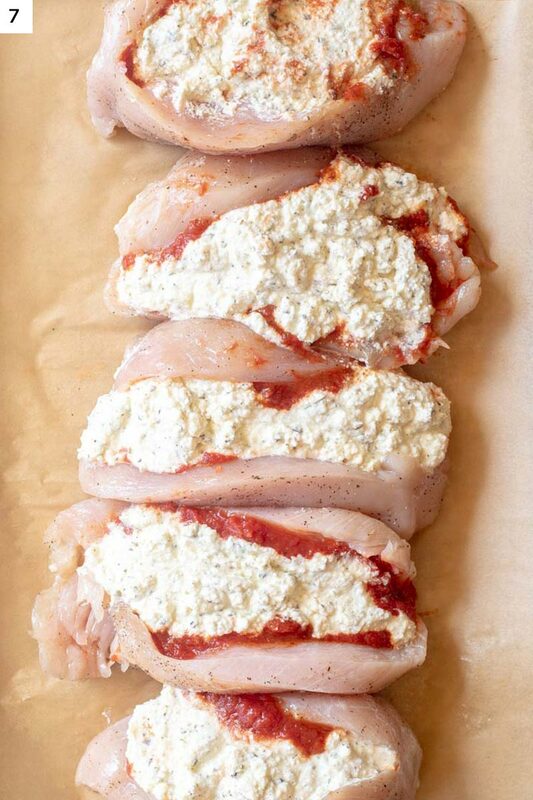 This stuffed chicken breast recipe is so perfect for low carb meal prep! 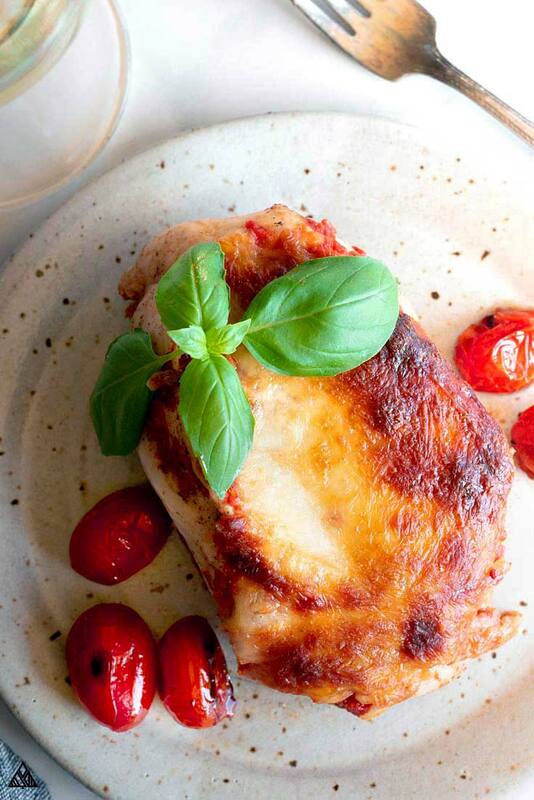 Simply allow your lasagna stuffed chicken breast keto to set in the fridge overnight. Then transfer each breast into a resealable bag, labeled with the date and “lasagna stuffed chicken”. Toss the baggies in the freezer for many low carb dinners to come! Next time you’re craving this dish, crank the oven and bake a lasagna stuffed chicken or two on a baking sheet until they’ve come to your desired temp. Hope you all enjoy this lasagna stuffed chicken recipe! Let me know what you think in the comments below! If you’re looking for more stuffed chicken recipes, check out below this recipe! 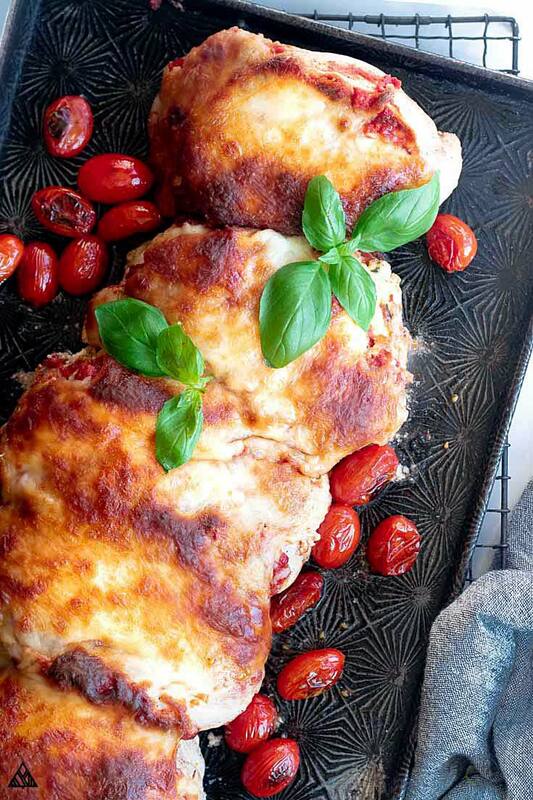 This keto + low carb lasagna stuffed chicken breast is the dinner recipe the whole family will fall in love with! 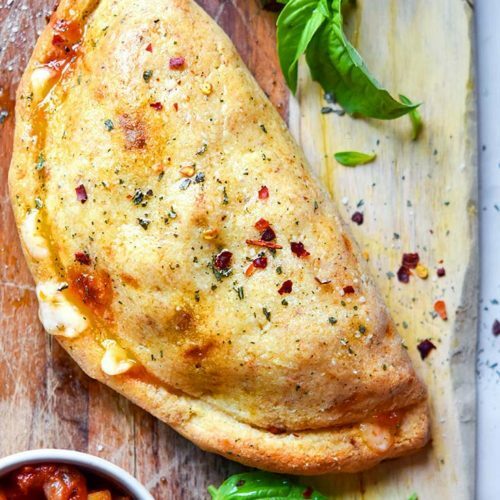 Stuffed with cheesy deliciousness, topped with marinara, and baked to perfection, what's not to love? In a bowl, combine ricotta, parmesan, egg, Italian seasoning, salt and pepper. 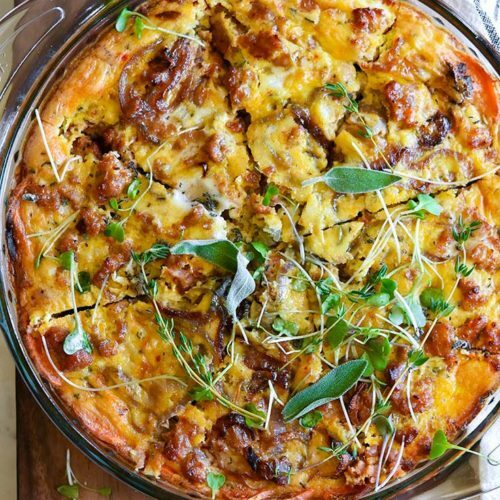 Set aside, this is your “lasagna stuffing”. Generously salt and pepper each side of the chicken breast and gently pat to adhere. Slice chicken breast in half to form a “pocket”. Place a spoonful of marinara in each chicken breast. Use the back of the spoon to spread and even out this layer. Spoon an even amount of lasagna stuffing in each of the chicken breasts. Cover with the remaining marinara. Bake in the oven for 35 minutes. Ensure the chicken is cooked through and no longer pink — if using a meat thermometer, the chicken should be at least 165 F in the thickest part. If you’re watching your carbs, read the label on your marinara to be sure it’s not high in added sugars. There should be around 7 grams of carbs per serving of marinara. Bake time will vary depending on how thick your chicken is, to be safe, cut through the center of your chicken to be sure it’s cooked all the way through (no longer pink). I know, stuffed chicken breast recipes are extremely addicting, easy to make, AND low in carbs. So why not stuff chicken breast every possible way you can? Here are some of my favorite fillings, if I missed your favorite, let me know in the comments below! Broccoli and cheddar are a match made in heaven, so why not make broccoli and cheese stuffed chicken? Serve a few of these over cauliflower rice for a tasty meal. Pesto is one of my favorite low carb food list ingredients — it’s so full of flavor and makes everything taste amazing. Add it to mozzarella stuffed chicken and you’ll be glad you did! Low carb chicken parmesan is incredible, but, the sauce makes the crunchy edge slightly soggy. 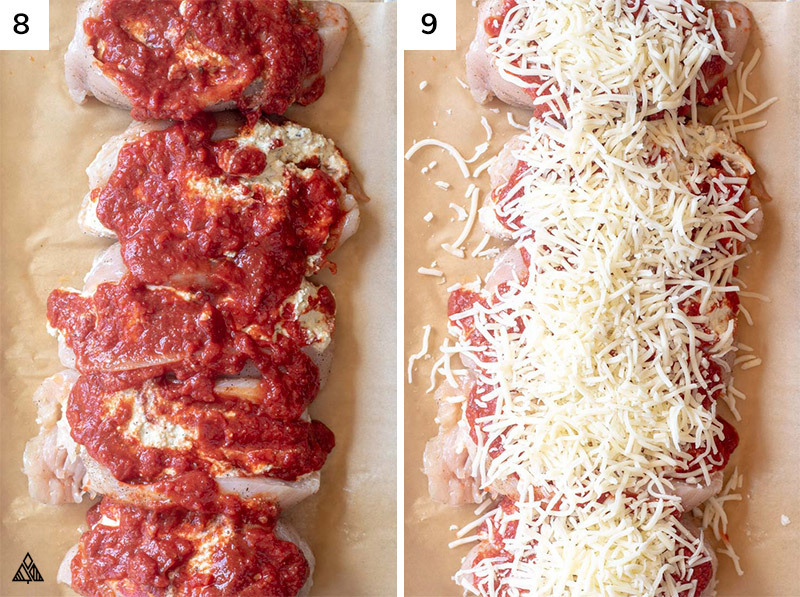 So, try stuffed chicken parmesan, and you’ll keep your crust crispy and delicious! Not sure what to do with your Thanksgiving leftovers? Make some stuffed chicken breast with stuffing, and you’ll never craving a leftover turkey sandwich again! Another flavor packed low carb secret is artichoke! Add it to spinach artichoke stuffed chicken and you’ll forget you’re eating low carb. Cream cheese and chicken go together like PB+J — so make some cream cheese stuffed chicken with your favorite low carb vegetables for a complete and delicious meal. Looking for a way to sneak some greens into your low carb diet? Try spinach stuffed chicken, you can even skip the cheese and use sauce only for a paleo alternative! Everything tastes more delicious wrapped in bacon, especially bacon wrapped stuffed chicken. Upgrade your favorite recipe with this additional step. Or you can get creative — every cheese tastes delicious in cheese stuffed chicken breast. Add some veggies, spices, even sauce, and you’ll be good to go!